We begin our travels in Belize, the only Central American country that uses English as the official language. The entire population numbers 250,000 which means Belize could easily fit into a suburb of any other Central American capital city. How did Belize become English speaking? In the days of Spanish colonialism, the Spaniards considered this area to be a backwater, devoid of economic interest. British pirates used it as a base, hiding behind Belize's barrier reef, the second largest in the world (Australia's Great Barrier Reef is the largest). In 1862 Great Britain declared Belize a British colony and called it British Honduras. It remained a British possession until September 21, 1981, when the colony of British Honduras became the independent nation of Belize. 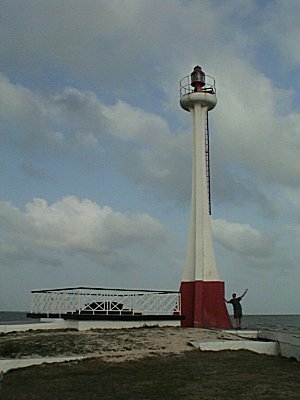 Fort George lighthouse, a Belize City landmark, which shows that Belize offers a scale down version of anything found in a port city. 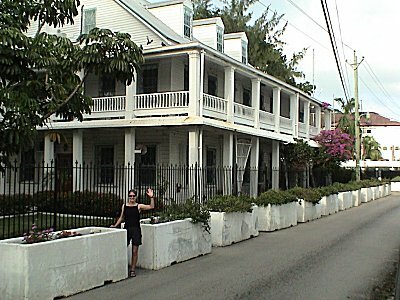 Visitors see in Belize City the least secure US embassy in the world, a quaint old Victorian house guarded by flower pot barriers.